This is the official support page for the iPhone app gear-grafr. We are asking all of $0.99 for it! The app works well (and renders sharply) in the 2x mode on iPad. Gears on a bike make your rear wheel seem smaller (a low gear) or larger (a high gear). The gear size is how big it seems. This gives you a way to compare gears on a single bike and also between bikes. A gear ratio per se takes into account just the gears. It represents the amount of “leverage” the gears provide. The front teeth ÷ back teeth. The gear size (here in inches, though we prefer SI units!) also takes into account the wheel size. It represents the effective size of your rear wheel: the real size × the gear ratio. The gain ratio also takes into account the length of the pedal crank. Could be a coming feature for new versions. This mobile app graphs the gear size and helps you better understand which gear combinations are higher and which are lower. When you first start the app, you see this screen, with no values. 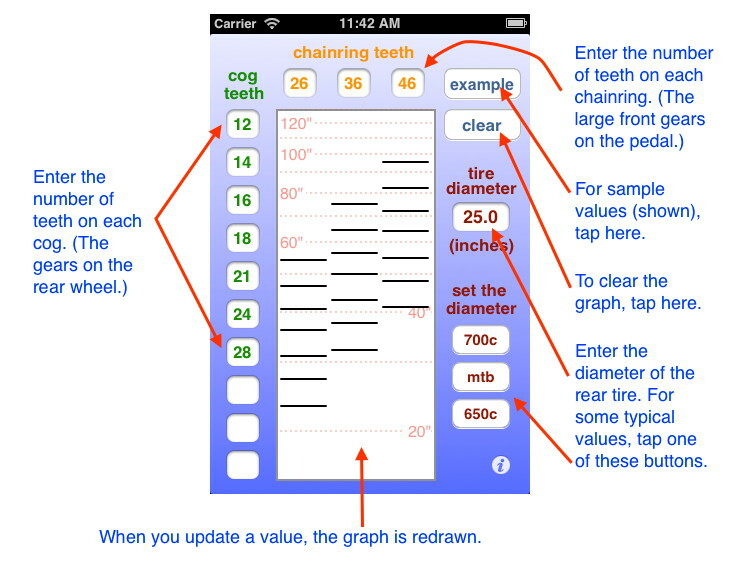 Tapping the “example” button fills in some values, and graphs them as shown. The annotations give a brief description of what to do. It may not be easy to get the numbers you need to plug into this app. Here are some tips. Cogs — The cogs are the conical stack of gears on the hub of the rear wheel. The number of cogs may be anywhere from just a few up to ten. The number of teeth may range from 12 up to 30. Counting these teeth can be a dirty business. This number is often stamped onto the cogs too. If your gears are clean enough to read them, you have my respect! Wheel diameter — This number is usually between 24 and 28 inches, and should be measured all the way across from rubber to rubber. Road bikes usually have what are called 700c wheels, but for smaller frames, sometimes 650c. Mountain bikes (mtb) are somewhere in between. Here is an exhaustive list of wheel sizes — in millimetres. So what’s the big deal about wheel sizes? Start with a bit of history. Remember (no, you don’t!) when bikes had the pedals welded to the wheel itself? Sometimes the front wheel, sometimes the back. One turn of the pedals produced one turn of the wheel. Some of these wheels were huge, and you still see pictures of these bikes, because they represent a certain era. Now why did they have those big wheels? Consider: if the wheel is big, then one turn of pedals moves the bike a long way. When you’re already moving, this is great: you can zip along at high speed. But it’s pretty hard to get started, for the same reason: one turn of the pedals has to move you a long way. We call this a “high gear”, even though in this case there are no actual gears involved. Bikes and cars behave the same way with their gearing. Ever try to start your car rolling in a high gear by mistake? It complained, didn’t it? So do your legs. Now contrariwise, if the wheel is small, it’s easy to get started because you can turn the pedals at a reasonable rate and get moving slowly. What you lose in speed you gain in power. This is a low gear. The gear inches is the effective diameter of your rear wheel. Now if I tell you my bike has a top gear of 100 inches, that means I move so far with each crank of the pedals that it’s like having a wheel 100 inches across. Now if you tell me that your bike has a top gear of 120 inches, we can both agree that you have a higher gear than I do, and ignore the details of how big our wheels are, or our chainrings or cogs or whatever. So the gear inches are like a language you can use in common between any two bikes. The most useful thing to get from these is the number of steps you gain or lose when you move to a different front gear. For example, on the road bike, when you’re speeding up and go from the small to the big chainring, you will probably also have to go down three steps on the rear gears or the jump will be way too big. This is how it works for all gear settings. The fraction front ÷ back is the gear ratio and tells you how much the wheel size seems to change, or equivalently how much faster the wheel turns than the pedals. I think a lot of people call the gear inches the ratio, which is harmless but not really correct. The illustration above shows the pure gear ratios (not inches, just front ÷ back) for the same two bikes. So first of all, this doesn’t tell you enough to compare them against each other, because they have different wheel sizes too. But it does show that almost all bicycle gears are overdrive gears — the wheels turn faster than the engine (that is, your legs on the pedals). Only in the lowest gear on the mountain bike are the wheels turning slower. For cars it’s the other way around: usually only the highest gear, if any, is overdrive. Why is this? The goal of using gears is to keep the engine spinning at its most efficient RPM. It turns out for cars that this is usually higher than the wheels RPM. Human engines are usually most efficient around 90 RPM, which is slower than the wheels should turn except on very steep hills. The moral: shift gears to keep your RPM (called cadence) in your best zone, buffered from the harsh reality of the uphills and downhills. Here are some other Web pages I have created. ana-grabr — Another iPhone app, that helps you find anagrams. The Golden Ratio Pages — A series of pages exploring the famous ratio. LL(1) Parsing — A Web tool for generating a parse table and using it to construct a leftmost derivation. Enumeration — A Web tool for finding permutations and combinations. Gaussian Elimination — A Web tool for reducing matrices to row echelon form. Combinatorial Music Theory — A lecture connecting graph theory with musical scales and chords. The DSP Pages — Explaining the Fourier transform in the discrete domains. Regular Expressions — Sometimes a non-match can hang the system. The Z-Board — A new kind of MIDI controller. This page has been loaded at least times.